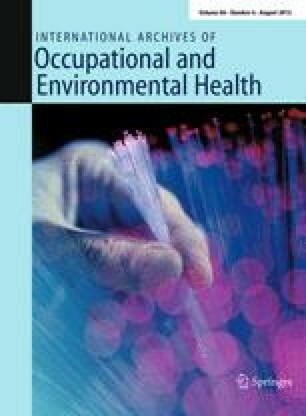 To assess central nervous system effects and visual fatigue induced by work with visual display terminals (VDT), symptom frequency was assessed and visual evoked potential (VEP), critical flicker fusion (CFF) and near-point distance were measured in 24 female keypunchers before and after 2.5 h of VDT work and in 6 non-VDT-exposed subjects at the same intervals. Each keypuncher had been engaged in data entry for 1–7 (mean, 4) years. After VDT work, the number of complaints of subjective fatigue as well as an objective measure of near-point distance were significantly increased as compared with those before work; also, the N75, P100 and N145 latencies of VEP were significantly prolonged. The change of P100 latency during VDT work was inversely correlated with the number of years worked in data entry. No significant change was seen in any of these tests in the non-VDT-exposed subjects. The changes in N75 latency and subjective fatigue related to drowsiness and dullness in the keypunchers were significantly larger than those in the non-VDT-exposed subjects. The CFF was significantly lower in keypunchers than in non-VDT-exposed subjects in both the first and the second tests. These data suggest that VDT work is associated with impairment of the visual nervous system function, that VEP latencies appear to be a sensitive indicator of visual fatigue, at least transiently, and that CFF appears to be a good parameter for estimations of chronic visual fatigue.